The 19-year-long rigorous study of Buddhism has begun for the incarnation of the Bakula Rinpoche with his “Chos-zhuk” (monastic enrolment ceremony) in the Drepung Loseling monastery at Mundgod in Karnataka. The enrolment ceremony of the 11-year-old Stanzin Nawang Jigme Wangchuk was attended by a large number of Buddhists from Ladakh and elsewhere in the country. He was identified by the Dalai Lama as the incarnation of the Bakula Rinpoche when he was just 2 in 2008. The 20th Bakula Rinpoche was born to Dorje Tsering and Sonam Dolkar with many auspicious signs, on Monday, 23 January 2006, at Kyagar village in Nubra, Ladakh. The 19th incarnation, Thupstan Chonjor, passed away on 4 November 2003 and it took about five years to identify the 20th incarnation of the Bakula Rinpoche through various rituals and auspicious signs. The time gap in identification of the 20th incarnation was full of anxiety, particularly for Ladakhis who worship him like God. The Bakula Rinpoche heads the main monasteries in Ladakh, including Spituk, Saboo, Stok and Sankar. According to Sonam Wangchok, secretary of the Himalayan Cultural Heritage Foundation, the 20th Bakula Rinpoche was enrolled for traditional studies on 22 November 2017, and it will take around 19 years to complete his higher studies and get the Geshe degree. The Pethub Galdan Targaisling Monastery and Pethub Labrang announced the dates for his ‘Chos-zhuk’ or the monastic enrolment ceremony when he formally entered the great monastic institution of Drepung Loseling Monastery. ‘Chos-zhuk’ ceremony is an extremely important event in the life of an incarnate lama when he begins his study and practice of the great treatises of sutras and tantras for the benefit of all sentient beings. Among those present on the occasion was the J&K Minister for Ladakh Affairs and Cooperatives Chering Dorjay, who said that the enrolment ceremony was held in the assembly hall of the renowned Drepung Monastery in which thousands of monks, devotees, guests and dignitaries from different parts of the country and abroad participated. While addressing the gathering, the minister said ‘Chos-zhuk’ ceremony is an opportunity to express our shared solidarity with the young Tulku. 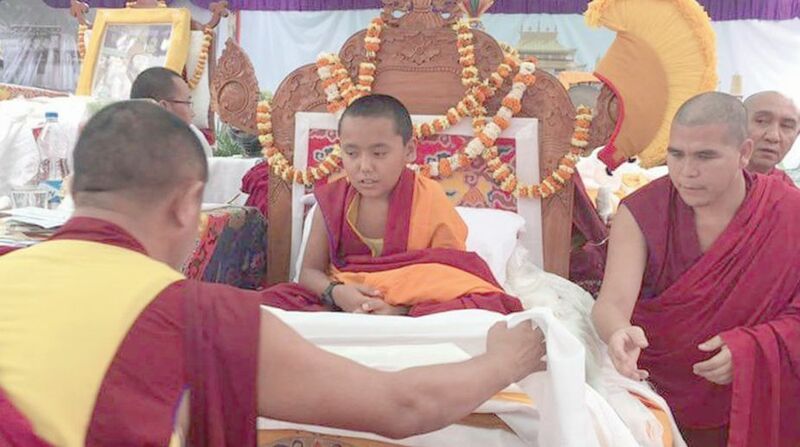 The 11-yr-old Bakula Rinpoche has been undergoing rigorous monastic education under the care of his tutors that will prove fruitful for the upcoming future of the state, especially the youth, he added. Stressing that the 20th Bakula Rinpoche will devote his life towards the welfare of all sentient beings, the minister said the people of Ladakh have great faith in him and believe that after successfully completing his monastic education, the Tulku will continue the great legacy of his predecessors for peace, progress and harmony in Ladakh. He said it is an extremely important event in the life of an incarnate Lama when he formally enters the monastic institution and begins his study of the treatises of sutras and tantras. The Drepung Loseling in Exile in Karnataka, where the 20th Bakula Rinpoche is undergoing monastic studies, is a replica of the Drepung in Tibet which was modeled after the great monasteries of classical Buddhist India, Nalanda and Vikramalashila, and was an institution dedicated to intense study of traditional Buddhist arts and sciences. Its training programme required twenty years of intense academic study, with rigorous testing and close supervision throughout, as well as six hours of debate each day. The focus of the programme was the five major topics of classical Indian Buddhism: philosophy, psychology, logic, metaphysics and ethics. This was followed by an internship usually lasting five to ten years. After completing this course of study and training, the student candidate would be allowed to stand for the Geshe Lharampa degree. Drepung was one of only three monasteries in Central Asia with the authority to award this degree, regarded as the most prestigious honour in the Tibetan Buddhist world. The Chinese Communist takeover of Tibet in 1959 resulted in the destruction of all but a dozen of Tibet’s 6,500 monasteries, and in the closure of Drepung, with most of the monks being either killed or imprisoned. About 250 of Loseling’s monks managed to escape. They were accepted as refugees in India, where eventually they built a replica “Drepung Loseling in Exile” monastery on land donated by the Indian government in Karnataka. Here they worked to preserve their ancient traditions. Over the years many more young spiritual aspirants have fled Chinese-occupied Tibet and sought entrance into the monastery, thus helping to preserve their traditional culture. The number of monks in the re-established Drepung Loseling has increased to more than 3,000.